With the redevelopment of the City Centre Airport lands on the horizon, PKNX explores the potential for a Do-It-Yourself Downtown and features presenters exploring the architectural, social, environmental and cultural potential for our urban core in the 20 slides x 20 sec per slide format made popular world-wide by Klein Dytham Architecture. I saw a few comments on Twitter asking why the event was held on the City Centre Airport lands if the focus was on downtown, but that’s exactly the kind of controversy that Edmonton NextGen was going for. And without question the redevelopment of the ECCA lands will have a big impact on downtown. I just wish NextGen had gone all-in and made Ryan Jespersen’s suggestion a reality – his idea was to setup a stage on the closed runway! How cool would that have been, presenting with the runway lights all around you?! 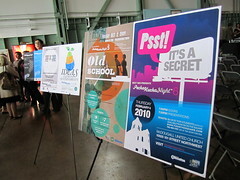 Being the tenth iteration of Pecha Kucha Night in Edmonton, last night was a bit of a milestone so NextGen setup posters from all the previous events (you can see my previous recaps here). 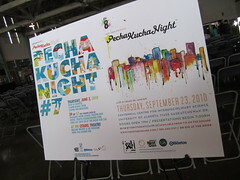 It was probably interesting for people new to PKN to see, and even for someone like myself who has been to every single one, it was good to look back. Our hosts for the evening were Ryan Stark and Brian Murray, and they embraced the location dressing up as airmen! I thought they did a much better job of just having fun on stage last night. At the break they did a flight attendant routine to direct people to the washrooms and bar, it was pretty funny! I sensed a bit of nervousness among the presenters last night, but having been up on stage myself I can totally understand why. 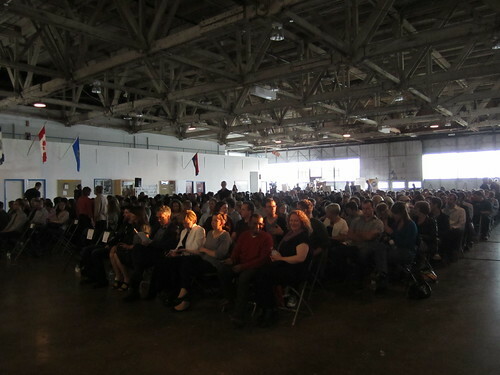 The venue was great, but it was also really daunting to be able to see all 400 people seated in front of you. Some talks had more energy than others, and overall there was a nice flow to the evening. The night got off to a strong start with Mike’s presentation on downtown. He’s the man that really brought Pecha Kucha to Edmonton, so it was cool to see him up on stage. I didn’t care much for Tom’s talk on the Capital City Downtown Plan. It’s important for people to know about, definitely, but I’m not sure it made for the best PKN presentation. Chelsea presented a visual diary of Edmonton’s urban culture, a really thoughtful and beautifully worded talk. Mike joined us all the way from Vancouver to talk about greening Edmonton. He shared some of his experiences covering buildings with vertical greenery. Ian’s concept, that “downtown should be a big patio”, was intriguing though it didn’t translate on stage as well as it could have. He’s right though, who doesn’t love patios and beer? Doug talked about some of the aspects of Paris that make it such a desirable city, and I like that touched on the potential for West Rossdale in here in Edmonton. Tai and Craig had some great concept visuals in their presentation which focused on the potential for urban farming. I really enjoyed Ron’s talk, and based on the laughter in the audience I think others did as well. He issued a warning that the changes we always talk about for downtown will dramatically change the character of downtown. The 25 cent movies, easy access to parking, and alleys for selling non-prescription drugs will all disappear! He had some excellent visuals too. Three of us made our third Pecha Kucha appearance last night. 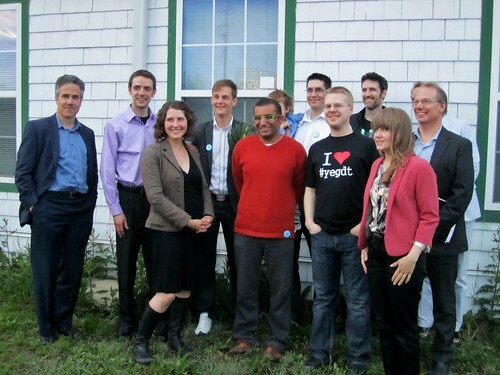 Shafraaz talked about the One Planet Living proposal he was a part of for transforming the City Centre Airport. Myron delivered an excellent tongue-in-cheek talk about the history of plans for downtown and how they haven’t panned out (kind of akin to this post I did back in February). And I made my second-straight PKN appearance to talk about the Alley of Light project. The most common piece of feedback I heard after the presentations were done was along the lines of “I’m glad you and Todd went last”. I think people appreciated the fact that we talked about actually doing something, as you could argue that the other presentations, while inspirational, were more about ideas and plans than execution. 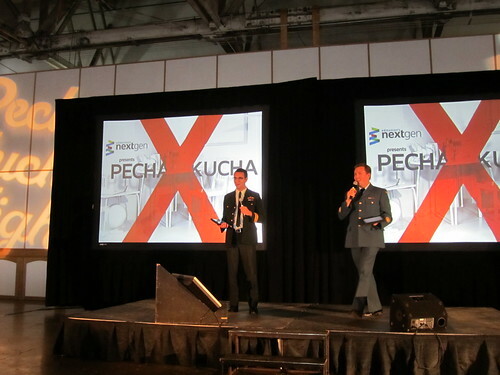 As with PKN9, last night’s presentations were live-streamed by the Edmonton Journal – you can watch the archived video here. 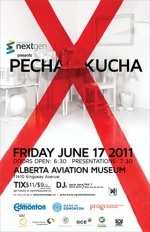 The next Pecha Kucha Night in Edmonton, PKN11, is scheduled to take place on Wednesday, September 14 at the University of Alberta (in conjunction with Alumni Week). Keep an eye on @EdmNextGen for updates. I received some really great feedback on my “I <3 #yegdt” t-shirt. I had it made at Bang-On Edmonton specifically for last night’s event (I can now wear it to any number of downtown-related events). There were some pretty intense prize last night as well, including a Molson beer fridge! Presenting sponsor BT Edmonton gave away an iPod touch that I won (actually it was Sharon’s ticket). I went up and told Ryan to redraw for it – I’m the last person to need yet another electronic device! To make up for it, he plugged both my site and What the Truck?! – thanks Ryan! Thanks to Edmonton Next Gen for another great event, to all of the volunteers for making it happen, and to everyone who attended or watched online! You can see the rest of my photos from last night here.